The upcoming 2018 Appliance Service Training Institute (ASTI) will take place in St. Petes Beach, Florida, January 22nd – 25th, 2018 at the beautiful Tradewinds Island Grand Resort. ASTI offers Independent Servicers the opportunity to not only learn the latest techniques to repair the ever-evolving high-tech appliances but also to attend business classes to help grow your business and become more profitable. Attending the ASTI affords the chance to connect with various people in the industry such as your peers, manufacturers and suppliers. Attendees will leave the convention feeling confident, and armed with the knowledge to run a more efficient, successful business. Trade Associations such as United Servicers Association was created to fill the need for training as manufacturers continue to cut their budgets, their OEM factory training opportunities are cut as well. The ASTI is the leading training event in North America in the industry with over 600 attendees and technical training offered by manufacturers such as Sub-Zero, Electrolux, Dacor, Bosch, Samsung, LG, Whirlpool, GE, Fisher & Paykel, Liebherr and Wolf, to name a few. A very impressive line-up offering attendees 5 days of intense training from manufacturers gathered together, conducting hands-on, factory training on current and new models in one location. In addition to technical training, numerous new and exciting business management classes will be offered beginning on our Pre-Event day (January 21) with the very successful Daniel Beale teaching “Grow My Business and Lead My Industry”; this class is in high demand and will be offered free to registered attendees. Various Software classes and user meetings will also accompany Basic Refrigeration and Electricity classes as well as a new class offering on R600. Attending these classes at ASTI can save you the hundreds, or even thousands, of dollars that it would cost if you were to attend them separately elsewhere. Speaking of saving you money, some of our new and motivating business classes are: Inventory Management Strategies taught by Michael Noe of Mr. Appliance, Success with Search Engine Optimization and Reviews and Service Company Growth taught by Nathan and Christina Kraker of ServicersWeb, an open forum on Preparing for Growth taught by three successful Independent Service companies discussing the differences in growth, and will tackle challenges and how to overcome them. Other classes include The Profit Principles – Know Your Numbers, Running an Efficient Business, How to Become Invincible to Lawsuits and Save Thousands in Taxes, Pay-Per-Click How Not to Waste Money, Liability Lawsuit/Claims – How to Avoid or Handle, Maximizing the Value of Your Business at Sale taught by Terry Kelm of Sunbelt, The Basics of Cloud and Remote Systems, Planning for Long Term Business Success and many, many more classes. These classes provide a training curriculum geared towards owners, service managers, customer service reps. and technicians alike. In addition to all of the technical, business and software classes there is also a large Trade Show with over 50 vendors that servicers do business with every day. You can meet with manufacturer representatives as well as see demonstrations on the latest software systems to help you run your business more proficiently. Network with successful servicers that have like-minded goals and businesses just like yours, from all over the country. Each year we hear how much people love attended the ASTI’s and appreciate all of the classes and training, as well as reuniting with the friends that they have made. Many servicers have formed Peer Groups out of these relationships to help each other thrive and grow. 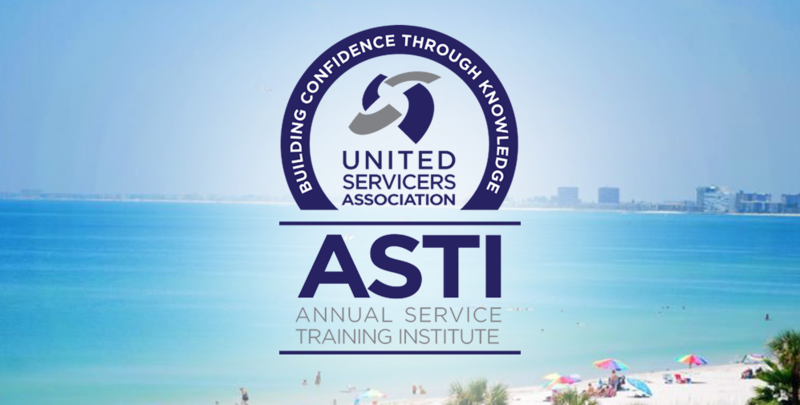 The ASTI provides a strong and compact line-up of training at a very reasonable price of $699 for United Servicers Association Members which includes breakfasts and lunches, a dinner banquet on Wednesday evening. Many attendees bring their families and extend their ASTI experience into a vacation, as the Tradewinds is a gorgeous, family-friendly beach front resort! This unrivalled event is highly anticipated and is a great opportunity to improve every aspect of your business. Find out more at www.ASTI.us. If you have any questions about the upcoming Appliance Service Training Institute, please email [email protected] or call us at 800-683-2558. We hope to see you there!